Wholefood product is the keyword to look for, this could be whole grain! Standing alone in the bread aisle with the choices reaching into the depths of supermarket eternity can without a doubt be daunting. The multitude of mixes, seeds, and types conjuring confusion for even the savviest and discerning connoisseur. You select a bread, tentatively reach for the packet, the signs are good, it appears to have the desired texture, that perfect balance between robustness and softness. How can you be sure that this is the one that will deliver the desired nutrients? It is evident that not all bread is made equal and as a consequence neither are their nutritional values. On many occasions, my gym colleagues and myself can be found debating the inclusion of such an item in our own meal plans and those of our clients. Ultimately it is entirely dependent upon the needs and goals of each individual. If you are in the fortunate position to be able to consult an oracle on these matters I suggest you tap into that source of knowledge, if you are not so fortunate here are some basic tips to arm yourself with as agreed by nutritionists. I rarely consume bread in any form, however, when advising clients or friends I suggest they become label lovers. I can often be found lurking on an aisle for an aeon perusing and scrutinising each macro and micro component of a product. I am always keen to be in full knowledge of the contents I am consuming, whatever the product. Bread can contain ingredients that would perplex most people. The inclusion of sugar is one that fixes a large majority, after all, it doesn’t taste sweet so why would it contain sugar? The exclusion of bread in its entirety does not suit everyone and if you make good choices and carefully consider its inclusion there is no need to avoid it like the plague as some articles have to lead us to assume. 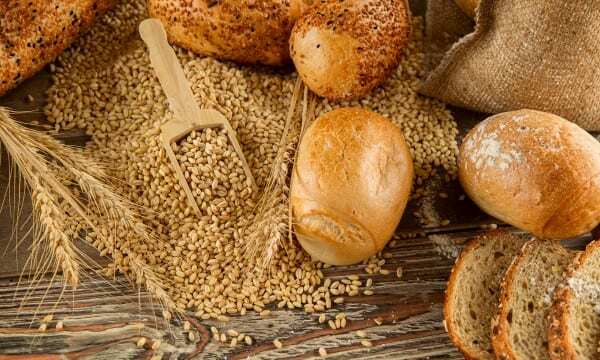 There have been trends hounding the carb and suggesting that grains are bad, but most nutritionists would advise that unless you have a specific allergy or intolerance, then you could be getting dietary benefits from including them in your diet. Wholefood products are what to look for, this could be whole grain, brown rice, whole oats or whole flax, they all contain the same nutrients so if you dislike one flavour there are others to choose from. Whole means that they have included the endosperm, germ and bran which in turn means that the product will contain fibre, protein, vitamins and minerals for your body. However, you must be very careful and read the labels accurately. A product is allowed to say wholegrain if 51% of the product is in that form. You should try to find products and bread that state 100% whole grain or as close to this percentage as you can find. A further hint is the consideration of the fewer ingredients the better. Bread with masses of preservatives and unpronounceable components are wise to avoid, as are those bread’s with high quantities of partially hydrogenated fats, trans fats, corn syrup and sugars. Organically produced small-batch products by artisan bakers can frequently be superior in quality, however, you can pay the price that this selective process affords. If you wish to keep costs down larger mass manufactured products are more concerned with quantity and the processing and subsequent costs involved with the manufacturer means the organic element can take a back seat. You should ideally be concerning yourself with the level of fibre in the bread. Your RDA or recommended daily amount is 25g per day and identifying a bread that yields 3g or more per slice can boost your advancement toward this target. Sprouted flours are definitely able to boost the level of nutrients and the beneficial effects of bread if you can source them to include. How Pharmacists can help you?